The chicken needs to marinate for an hour, and the veggies will need 10-15 minutes in the oven before the chicken goes in for 15 minutes, too, so time accordingly and everything will go smoothly and in a quick sequence. In a small bowl, whisk together the sherry vinegar, honey, thyme and smoked paprika. Reserve some for saucing the chicken at the end. 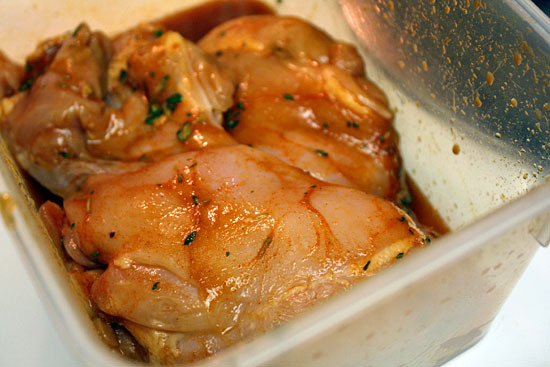 Use the rest to marinate the thighs for an hour. According to your timing, preheat the oven to 450 degrees. 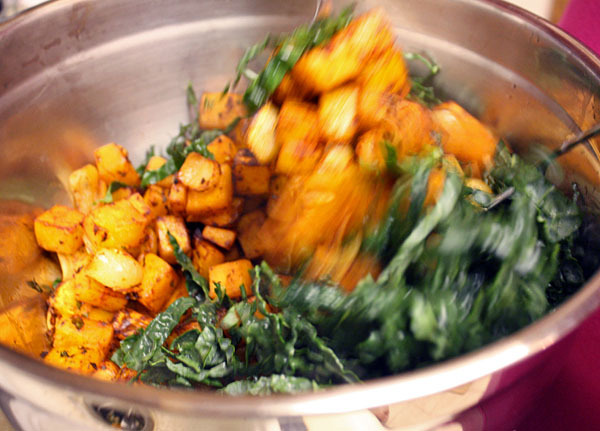 In a large bowl, toss the squash and cipollini onions with the oil, smoked paprika, thyme and a little salt and pepper. 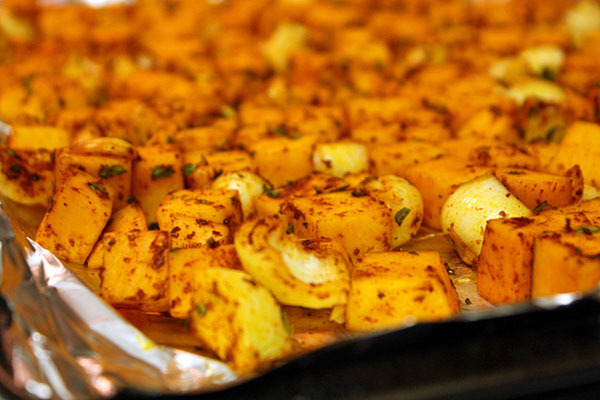 Roast in the oven for 10-15 minutes, until the squash gets a little golden brown color. While the veggies are roasting, spray a baking dish with cooking spray and place the thighs in the baking dish. Season with salt and pepper. 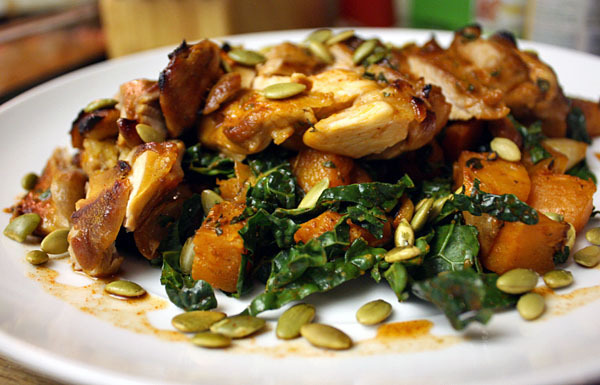 When the veggies come out, toss with the kale. Slice it as thin as you can to ensure the heat wilts it enough. If you cut it a little too thick, like I think I did, cover the mixing bowl with foil to steam it a little. But, the thinner you cut the kale, the crisper you can assure the squash will stay. At the oven, move the rack to the middle and set it to broil. 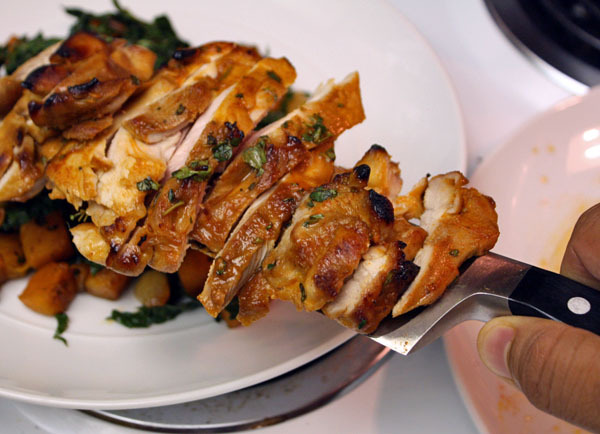 If your broiler is under the oven and doesn’t allow you that much space, you’ll just have to turn the chicken halfway through the cooking process. 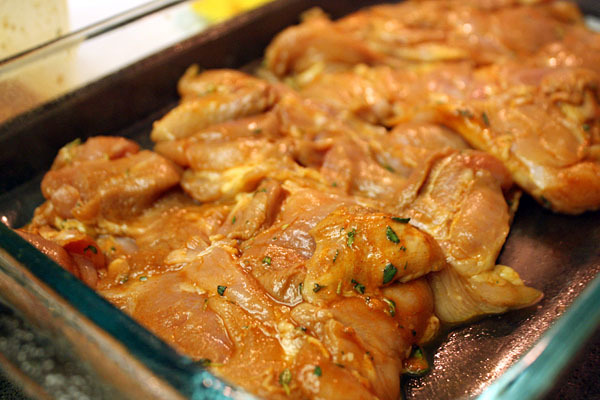 Broil the thighs until fully cooked and caramelized on top from the honey marinade, about 15 minutes. Allow the chicken to rest about 5 minutes before slicing. To plate: Put the veggies on the plate. 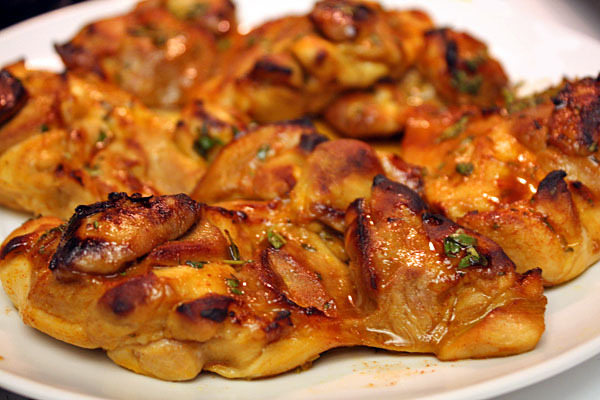 Slice the chicken and top with the remaining marinade. As a final touch, make it rain pepitas and dig in!